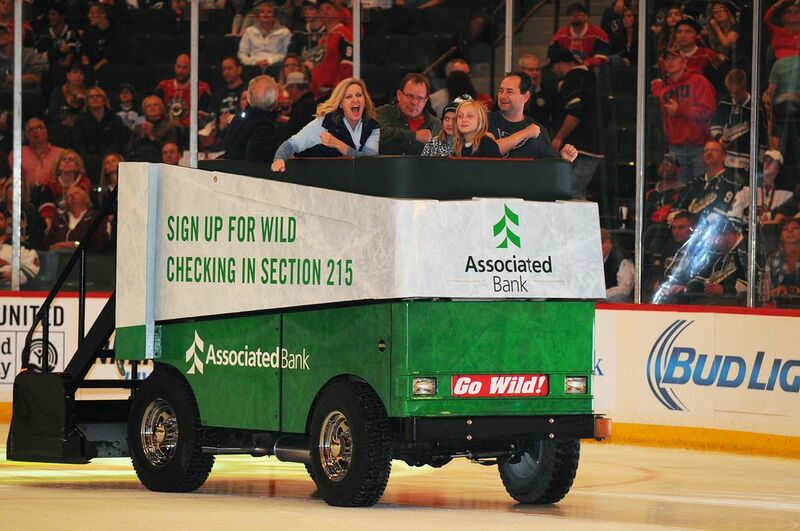 St. Paul, Minn. – December 22, 2015 – Associated Bank is offering Minnesota Wild fans an opportunity to win a ride in the Associated Bank Ice Cruiser at all home games at Xcel Energy Center. Associated Bank is offering a fee-free ATM to all fans, including non-bank customers, along with an opportunity to win a ride on the Associated Bank Ice Cruiser. (This excludes any charges from the individual’s financial institution). After a transaction is made at the Associated Bank ATM located in section 215 next to the bank’s Power Play Zone, a receipt with entry instructions is provided. Associated Bank offers fee-free ATMs to all current bank customers, and the Associated Bank ATM at Xcel Energy Center is an opportunity for non-customers to enjoy free transactions. Four lucky winners will enjoy a ride on the Associated Bank Ice Cruiser during the second intermission of the game. “We’ll continue to enhance this partnership to ensure fans have fun and engaging opportunities throughout the season,” said Piotrowski. Also offered within the Associated Bank Power Play Zone is an interactive fan challenge area where fans can score on an unprotected or ‘shorthanded’ goal and receive a GIF file of them in action for immediate sharing on social media. As the ‘Home of Wild Checking,’ fans are able to show their true pride with new customized Wild Checks and Debit Cards. This will include a $150 offer and 15 percent discount at all Hockey Lodge locations, the Wild’s official team store.